The show created a lot of buzz. The Glen Ridge town council officially proclaimed November 22 "Secret Garden Day;" our local restaurant created a special Secret Garden prix fix menu to honor the show; and we ended up being sold out for our final performance! 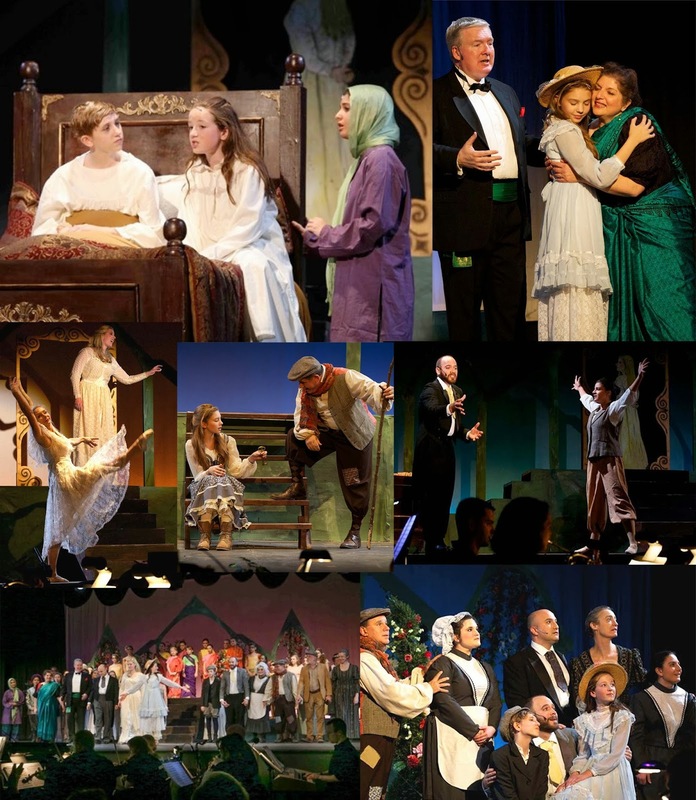 I couldn't be prouder of the show, and am in a bit of withdrawal, now that it's over. But I plan to get back to creating more video and blog tutorials in 2014. Why 2014? Because on Saturday, I leave for the Czech Republic to visit my daughter, Mariel, who is teaching for a year in Znojmo. She's been keeping a blog about her experiences -- I know I'm biased but it's fascinating! 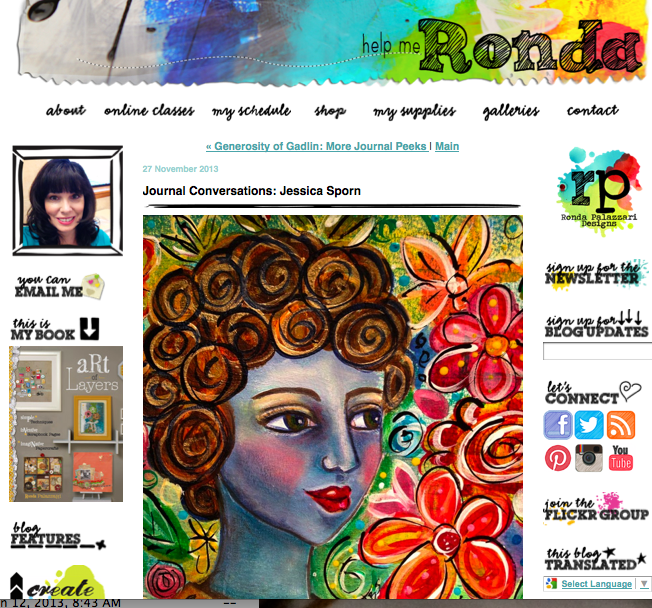 In the meantime, today I am on Ronda Palazzari's blog today, talking about art journaling. And I'll be on Stencil Girl Talk on Monday with some holiday projects and tutorials! 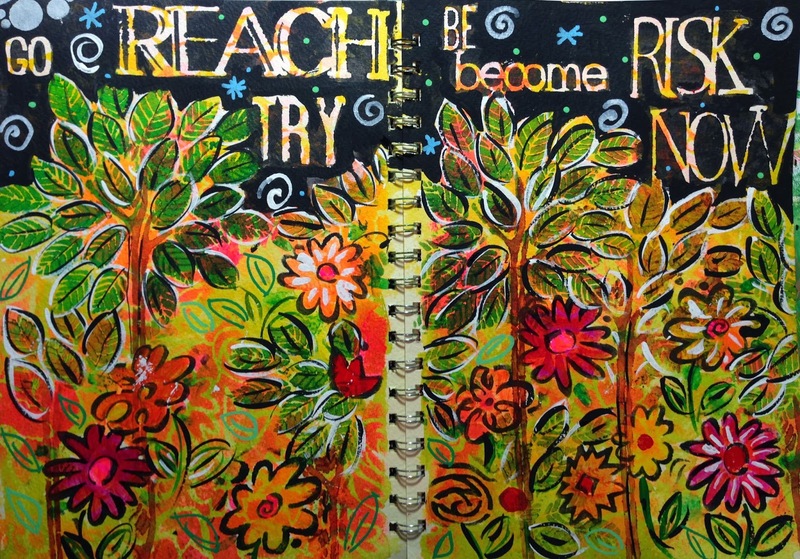 What beautiful colorful work and the more stuff the better on the page. I work that way too! I don't have any stencils and would love to try them. Thanks. I've already contacted Linda and am so happy to start her off on her love of stencils. Little does she know that it's addictive! Here's a different take on gratitude by Nicole Antoinette, writing about 5 often overlooked things we can be grateful for. Lest you think I take you for granted, I want to thank all of you who read this blog. I so appreciate the online community of supportive artists and creative talents "out there." In this season of gratitude, I want to make sure you know that I am very grateful for all of you. I'm off to check out your post on Ronda's blog! Congratulations Linda! Sounds like you have been super busy and no, I haven't forgotten about you! I keep checking daily to see if there are any new posts! Enjoy your visit with your daughter!!!! Safe travels! Wow Jessica, you´ve been busy. And all kinds of exciting things happening for you! congrats on the features, and I hope you´ll have a wonderful time with your daughter! thanks for the advice with my pictures. I´m afraid it´ll lower the quality of the prints though ... Not sure yet what to do. Have you noticed any difference in quality after you did that? So happy the show was a success.. and now off to visit your beautiful Mariel. Will be so wonderful to see her and spend time. You know how much I love your art and journaling style. Happy for Linda! Happy for you, Jessica, and your successful production! Happy for Mariel who will be overjoyed to see her Mama! Much for which to be thankful! Mwah! Congratulations on the show, and have a wonderful time with Mariel!